The annual event is a fundraiser for the Human Access Project. Open to all ages, TBF begins with, naturally, a parade. 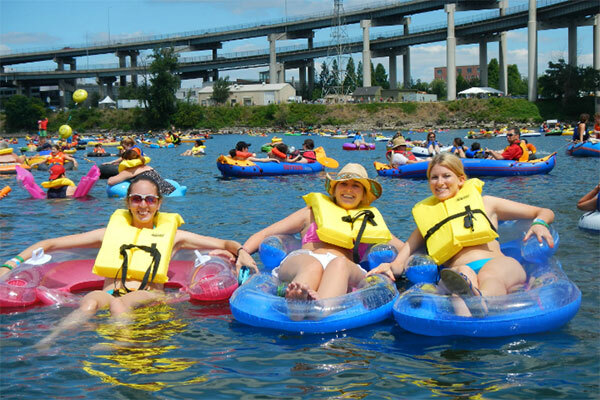 Floaters gather at Tom McCall Bowl Beach (where the Blues Festival is held), then carry or wear their floatation devices and march south along Waterfront Park to the put-in point at Poet’s Beach beneath the Marquam Bridge. Floaters will paddle down river and land on the west bank at the Tom McCall Bowl. Here, Portland’s grandest downtown beach party will be held – complete with music barge and live bands, food carts, beer/wine garden, sponsor booths, and a kids’ activities area.